John Diedrich and Raquel Rutledge of the Milwaukee Journal Sentinel, Jeremy Diamond of The GW Hatchet, Aki Ito of Bloomberg News, Sarah Smith of The Daily Pennsylvanian and Jeff Kearns of Bloomberg News. 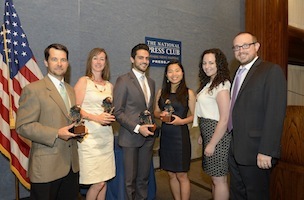 At this morning’s Institute on Political Journalism Awards at the National Press Club, reporters from The Milwaukee Journal Sentinel and Bloomberg News received the top awards from The Fund for American Studies – a DC-based education non-profit – for the second year in a row. Student reporters from The GW Hatchet and The Daily Pennsylvanian were recipients in the college category. The 2014 Excellence in Economic Reporting Award was presented to a team of reporters from Bloomberg News for their seven-part series on the brave new world of “Big Data” software services. The report was lead by Aki Ito with Jeff Kearns, Craig Torres and Ilan Kolet and presented by John Merline, senior writer for Investor’s Business Daily. The 2014 Clark Mollenhoff Award for Excellence in Investigative Reporting was awarded to John Diedrich and Raquel Rutledge from The Milwaukee Journal Sentinel for “Backfire,” a series that exposed flaws and a lack of government oversight in undercover Bureau of Alcohol, Tobacco, Firearms and Explosives stings across the country. The award was presented by FOX News Channel producer Lucas Tomlinson. 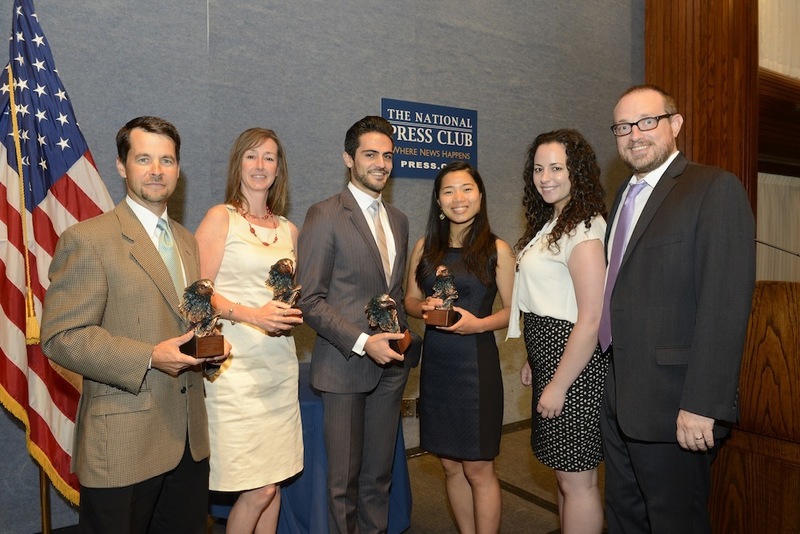 The Washington Examiner’s Tim Carney presented the 2014 Excellence in Collegiate Reporting Awards. First place went to Jeremy Diamond from The GW Hatchet for three separate entries including a piece alleging GW misrepresented their admissions and financial aid policies. The Daily Pennsylvanian’s Sarah Smith earned second place for a piece on how UPenn handled alleged victims of sexual assault and those who experience mental health problems. First place winners received $2,500 and a bronze eagle trophy.